Night At The Museum: Secret Of The Tomb (2014). 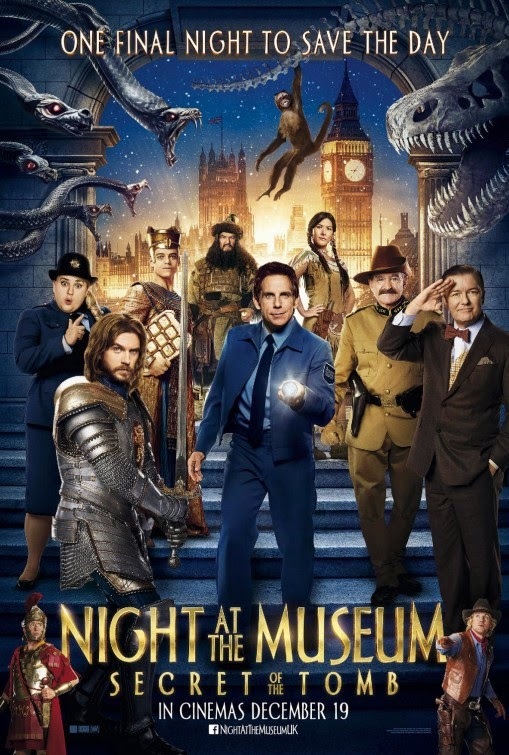 Even though I am getting older and way too close to the adult world for comfort, Night At The Museum will always be one of my favourite family-friendly movies ever. With wit, trouble and extremely lovable on-screen characters, each movie has never failed to tug at my heart strings or make me laugh and embrace the silliness of serious situations. However, it is true that each movie seem to make use of the same formula again and again. So if you truly want to enjoy it, just sit back, enjoy what they give you and laugh along. I promise it is way way waaaay better than Transformers. Naturally. Basic synopsis: Larry Daley is back and traveling away from his favourite museum ever to solve the mystery and save the magic before it is too late. Along with his favourite exhibits, they embark on a journey to fix things while Daley is struggling to accept that his own son is growing up, and that it is time to let go. Hmm, even though I really enjoyed the film, it is difficult to say if the characters had any growth or change at all from the first to the last of this franchise. The focus has always been about how different their personalities are and the friendships they have forged, or how they are always willing to help and support one another. And that is precisely what this feel good movie is about, so even though most critics are complaining… I do not really mind. And let me just say that I have never ever disliked Sir Lancelot so greatly in my life. So good job Dan Stevens (IV), you portrayed him well. On a side note, it was a pity that Rebel Wilson played such a small role. Her character was not much of a character, really. Just there to add some comedy, and considering how she is way more than that, it would have been great if she played a slightly bigger role. Lastly, it was heartwarming to watch Robin Williams and Mickey Rooney work their magic on the final installment of this film. Their presence and their hard work will always stay with us, and I think that is one of the greatest things about film and technology. Thank you so much to the Asian Civilisation Museum for the preview tickets. It was wonderful. This is the classic case of being drawn in by the movie trailer to watch it and have all anticipation torn to shreds in the cinema and gain a hell lot of disappointment by the time you walk out the cinema. 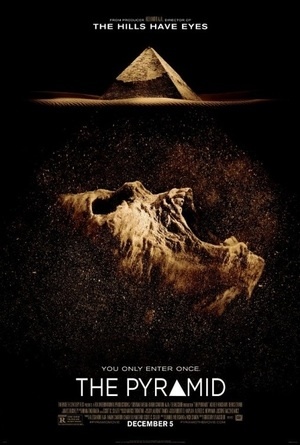 Basic storyline: An archaeological team decided to explore a lost pyramid that was buried under the ground (even though we all know that ancient pyramids always curse new visitors) and they discovered way more than they bargained for. I do not really know what exactly I was hoping for but considering that the movie is considered horror, I guess I wanted more scares, suspense and tension. Surprisingly, the movie lacks in all those areas. It relied heavily on the build up of music and occasional jump scares or sudden switches in camera angles. That is fine when it is just for a scene or two… But to bank heavily on only these two techniques throughout an entire movie is a little ridiculous. And just like the storyline itself, everything became incredibly predictable and after a while, boring. I am not kidding when I say that you will be able to predict which character would be killed off first and how they would be killed off and why they were killed. It is that predictable and totally does not give you anything new to work with. Though to be fair, I must say that the gore and make-up effects made it watchable for most parts. Sometimes they came off as extremely unbelievable and fake, so they became distractions instead of enhancing the quality of the movie. Lastly, the dialogue started off as bearable. Then it became pretty redundant and was just going in circles and ended with it being the most irritating quality of the movie. One might just be better off watching the movie with the mute option switched on. The words had no purpose and it was just to kill time as well as go with the poor visuals. Even the cheap humour by character Fitzie (James Buckley) went stale after a while. Ugh. Final verdict: I seriously do not know how to feel about this movie, but I do know that I will probably never watch this every again. Lesson learnt: Never ever trust movie trailers ever again. Well, I can no longer ignore the plot holes and how some sequences were totally ridiculous in urgent situations and only placed in just to make the on-screen action more impressive. Yup. I am growing up and growing old and amazing things that do not make much sense do not appeal much to me anymore. But no regrets catching this adorable white being on the big screen though. He stole the show, and my heart. Out of the six heroes out there, he was the one that restored my absolute faith in humanity all over again. The ironic part is that he is a robot and not even human. Baymax is created by Tadashi Hamada – the older brother of 14-year old robotics genius Hiro and the one that inspired the rebellious (and proud) teenager to attend school to further his talent. When things take a sudden turn for the worst and revenge is the first thing on Hiro’s mind, the young boy suddenly finds himself teaming up with Tadashi’s friends as well as Baymax to get to the bottom of the mystery. With the movie running for only one and a half hours to accommodate the short attention spans of children and impatient parents, the team tried really hard to keep to the flow of the story and to finish it all within the tight time frame. That pretty much resulted in sudden (extreme) change in mindsets as well as quick realisations that were honestly, too good to be true. Maybe I am just skeptical, but I thought the thought processes of Hiro throughout the movie was way too mature for his age. Switching from revenge to being all sorry in a span of three minutes? But I must say that the layouts, animation skills as well as the culture that it has introduced onto the big screen were great. 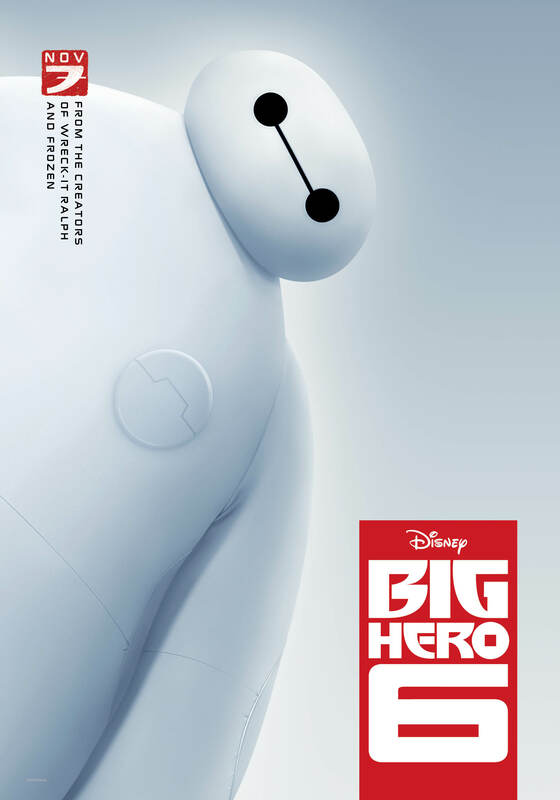 Most animation films revolve around animals, toys, fairy tales as well as old-fashioned heroic figures, but Big hero 6 decided to bring the focus to the extreme use of science, technology and design. These topics are usually not introduced until way later in the growing stages so I thought the concept was interesting. And introducing the endless possibilities, fun as well as encouraging creativity to a young audience is a gesture I really appreciate. San Fransokyo is also one place that I would love to live in because it is a metropolis made up of such a great blend of wild imagination and the comfort of “normalcy”. Full of heart and genuine gentleness, it was a watch that reminds everybody what life really is about. Jack and the Cuckoo-Clock Heart (2014). A sucker for animation films, I was really excited to catch this film last Thursday (all thanks to Hot91.3fm!) at Plaza Singapura’s Golden Village with a good friend of mine that shares this love with me. 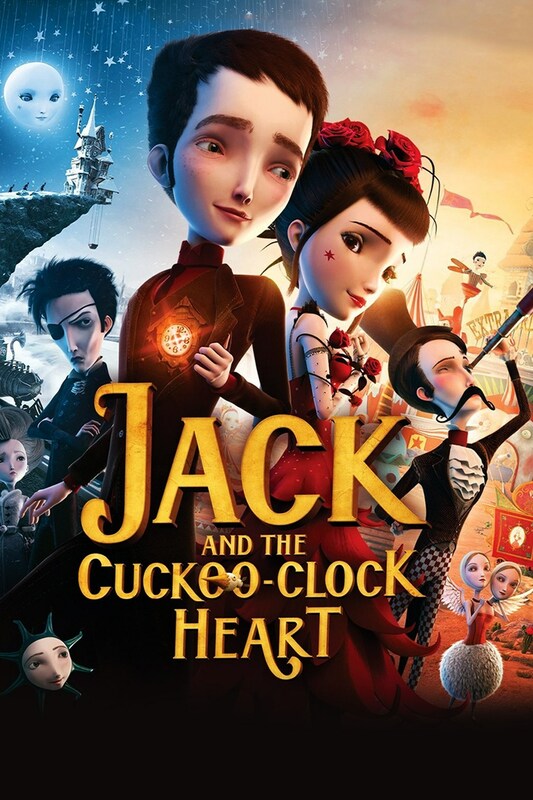 As telling as the title of the film, the tale, set in Edinburgh Scotland back in 1874, revolves around the journey of this boy Jack that has a cuckoo-clock heart because he was born with a heart made out of ice. To save his own life, there are three rules that he has to abide by but as he grew up, he started to struggle with the third rule – of never falling in love, after a chance meeting with the lovely Miss Acacia. With bullies making his life miserable and a sudden disappearance of the love of his life, how will his story pan out? And will he survive the delicate mechanics of his heart? The entire journey was filled with highs and lows, and that made it exciting to watch. It was an emotional journey with many tough decisions to be made and plot twists placed to surprise the audience in clever places. However, the action of it all burns very slowly and occasionally I found myself zoning out because absolutely nothing seemed to be progressing on screen. I might have appreciated it better if the pacing of it all was slightly tighter. One thing I really enjoyed about this film will be the incorporation of other forms of art, with the most prominent being the use of music and songs. It kept the energy from falling sometimes and aided the impressive visuals in terms of building the mood as well as atmosphere for the situations presented. After a while, certain tunes are being associated with certain moods and as an audience member, catching it and knowing what to expect made me feel more connected with the film – as if I got let in on a secret. A fun fact I discovered after my curiosity got the better of me: the entire film is actually a feature film based off the concept album of French rock band Dionysos. The illustrated novel of it was actually written by the band’s lead singer Mathias Malzieu and all music were originally composed by the entire band. I thought that is pretty impressive and it explained why the songs were done so well. Another thing I really liked about this animation film, was of course, the choice of design. It was entirely done in a surrealistic style – train-swallowing moon, talking heads as well as a stage that can be folded into a luggage. This film really pulled me into its crazy world and invited me to open my mind and imagine with the characters as the tale goes by. Anything goes in this film and with a reality so magically full of all sorts of possibilities, it was fun to experience and constantly be surprised by what might happen next. But it was not all crazy fun and without meaning. With a nicely wrapped ending that leaves you with questions about life, death, choices and sacrifices, Jack and the Cuckoo-Clock Heart managed to balance the beauty of madness as well as emotions. This quality really makes the film worth watching and I am so glad I got the chance to experience it in a cinema. Ju On 3: Beginning of The End (2014). It really was not that scary and for a couple of times, I actually laughed out loud in the cinema. But this is a horror show so I guess it is really up to individual preferences and taste. For me, this movie did not really work for various reasons. Basic synopsis: School teacher Yui visits the home of her student, Toshio Saeki, because of his perpetual absence from school. However, the visit turns out to be more than she bargains for as she relives the tragedy of the Saeki household that happened ten years ago. But seriously, the synopsis sounds slightly better than what actually happens on screen. Because what really happens is a total mess with loop holes here and there that just makes you frown and wonder what exactly is going on. I understand that the tragedy and plot resolves around the Saeki household and the events take place inside the house but I think it will help make things more interesting to film the action or entrance from different angles? I am not sure if the repetition of the house in the exact same angle is on purpose but after the third time, it gets boring. Even though the people that enter the house are usually different, it does not help. How is it that you are afraid and still go ahead to check out the mysterious humming all on your own? Wouldn’t you run away or ask for help? So after the revenge by the spirits and the people start disappearing one by one, wouldn’t anyone notice their disappearance? How is it that the mother’s body is able to go unaccounted for ten years? I have a lot of questions but no answers, unfortunately. It got so frustrating for me that halfway through, I just stopped questioning everything and I did not feel engaged by the movie at all. Thank goodness I had my bubble tea. Ugh. Seriously. It was not scary at all. It was super funny and from that point onwards, I just lost it. Completely. One thing I liked would be the humming though. It is probably one of the more honest and innocent moments that the movie kept and to me, that was really nice. The movie needed the quiet and slow moments to ground it more, really. In the end, what really happens is that anyone and everyone that enters the house is doomed. Cue a lot of scare antics that might be nonsensical at times. Black out. Period. One of the many last minute movie decisions of my life. Well, I remember catching 21 Jump Street and I quite liked it so yea. 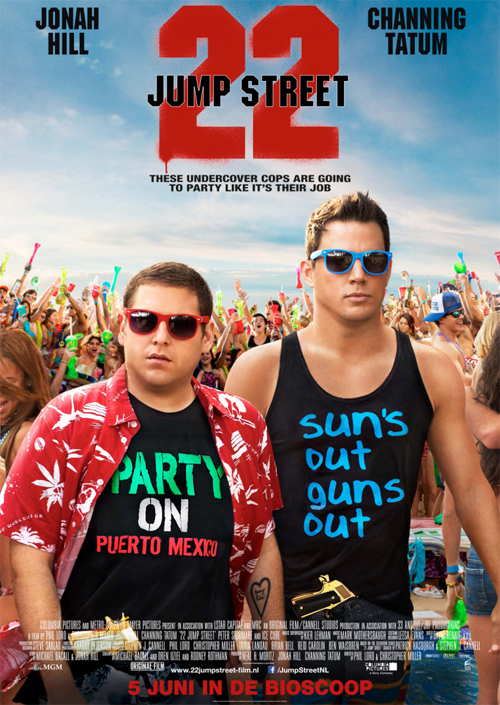 22 Jump Street is way better than 21, I would say. The sense of humour is essentially the same but played up. This is one movie that I actually laughed from start to finish, pretty much. And it was not because the movie was done up so badly that it is hilarious. The jokes, facial expressions and the underlying meanings of certain situations were just so classic. It was good. If you like dramatic, ridiculous, weird and puns from time to time, you will definitely like this movie. And beneath the humour, there is a pretty strong storyline to it which gives the movie a purpose for even being shot in the first place. The events actually made sense, with the beginning and end of the 110 minutes coming together really nicely. I cannot say that the whole college, finding yourself and bromance themes are new because they are not. However, they are dealt with so nicely in this movie, I did not mind it at all. They weaved in nicely with each other and no theme was forced onto the script simply because. Anyway, I would just like to say that my favourite scene is the beach. It is so amazing to see so many people doing so many different things and just creating the whole atmosphere. Details like, having a deejay, drinks, floats and umbrellas were all there. I don’t know about you, but crazy details totally impress me. And I think the best part of this movie is that there are always clever pauses between funny bits that go with the flow of the action while giving the audience ample to laugh out loud and quieten down. I really appreciated this because I was laughing really loudly for some bits and am so glad I did not miss any dialogue or action. It is the kind of movie you watch during casual sleepovers with close friends. I like. How To Train Your Dragon 2 (2014). This movie is by far the most adorable animated movie I have ever watched. For this year, at least. But I must say that I was really engaged throughout the whole movie. It was a great adventure and utterly satisfying watch. My face cramped a little bit from smiling too much during the 105 minute watch. 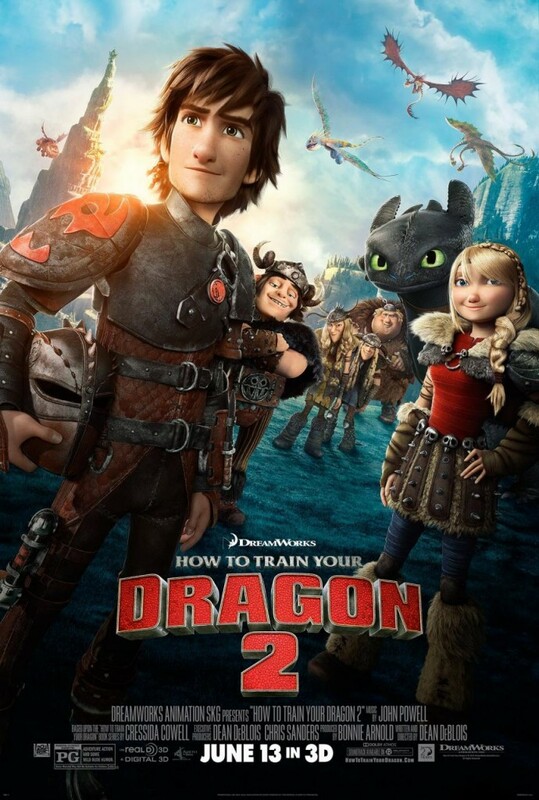 Based on the book series by Cressida Cowell, How To Train Your Dragon 2 was basically about Hiccup trying to find out who he truly is as a person while trying to save the dragons from a very bitter human-being known as Drago Bludvist. Even though several themes were present, such as familial love, self-discovery, harmony and good versus evil, they were all weaved into the tale perfectly and was not messy or overwhelming or under-developed. The storytelling was clear, simple and straightforward, which I appreciated very much. It also helped that the scenes were all amazing and beautiful to look at. The various scenery that came up each had their own personality, which was interesting for me. The use of nature, colours and various elements present under different temperatures were so wonderfully combined to create a world that arouses curiosity and injected fun into the movie. All the different dragons were gorgeous as well. Different patterns, textures, colours, shapes, sizes and characters – totally stunning. As for the characters themselves, I liked how detailed they were. The little things like facial hair, wrinkles for the adults and the way their hair were designed, caught my attention and I truly appreciated how they were taken care of and not left out. It made the characters more realistic and impressive to look at. Maybe it is just me, but the fact that the artists and animators took the extra effort to add all these teeny weeny details in and not use the ‘this is just a cartoon so let us just simplify everything’ excuse, just makes me respect the movie more. Basically, the art for this movie is super. The camera angles and shots taken displayed the art well and framed the action nicely. I felt everything was rather smooth and there were no shots that felt really sudden or out of place. They all facilitated the animation and story well, and were not distracting so I liked that. Hmm, I do not really know what else to say. Just try to experience this movie for yourselves. It really is pretty great. I promise. Anyway, may I have Toothless all to myself now? Because the dragon totally stole my heart with his fierce loyalty and cuteness.